A recent acquisition by Karla Nielsen, Curator of Literature, of material relating to La Monte Young and Angus MacLise from Kenneth Mallory Booksellers coincides with a unique, historical audio recording discovered recently in the Amiri Baraka Papers (pictured above). The set of 1964 concert posters for La Monte Young’s performing ensemble, then consisting of John Cale, Tony Conrad, and Marian Zazeela, represent the beginnings of The Tortoise His Dreams and Journeys, a well-known yet sparsely publicly-documented work by Young and the Theater of Eternal Music that came to be a musical turning point for Young and his colleagues. 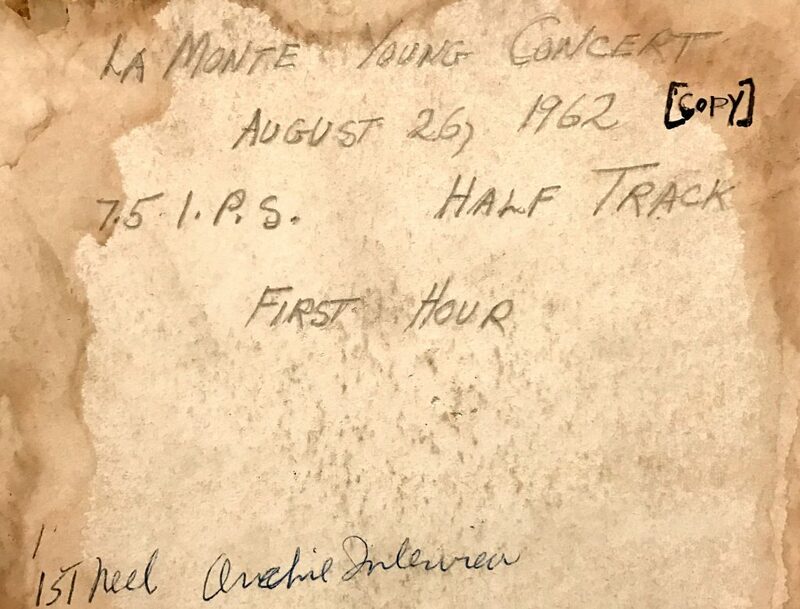 Even more obscure than The Tortoise are the precursors to that work, yet a moldy audio reel box discovered in the papers of Amiri Baraka with the inscription “La Monte Young Concert August 26, 1962” came to light during digital preservation of the collection’s audio-visual materials. With the help of Jung Hee Choi, friend and collaborator of La Monte Young, we were able to identify more exactly what the contents reflect. While the box containing the tape indicates an hour of music, in fact there is not much more than ten minutes worth of the concert reflected on the tape. The majority of the tape consists of an extended interview with saxophonist Archie Shepp. We could presume that at that time, when La Monte was primarily playing saxophone in the group rather than singing alongside Marian, Amiri Baraka saw a common interest in the two musicians with a more direct association than would be obvious today. Beyond just conceptually overlapping for Baraka, it also appears that the Shepp interview is recorded over the missing minutes of the La Monte Young concert on the tape. The second portion of the recent acquisition is an addition to our existing collection of Angus MacLise Papers. MacLise, who plays hand drums on the August 26, 1962 concert recording aforementioned, in 1962 also published an alternative calendar entitled Year. Previously not well-represented in our MacLise collection, our 2017 Addition now includes several typed and handwritten manuscripts and revisions for Year, as well as correspondence, around the publication. The MacLise Year calendar, since its publication, has maintained interest in the avant-garde music and poetry communities, and there is even a Twitter feed (@MacLiseYEAR) which bills itself as a day-by-day recitation of the work. 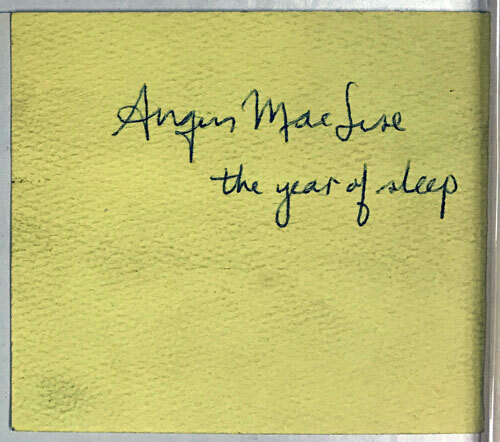 Note in MacLise’s hand, affixed to “YEAR” manuscript in the 2017 Additions to Angus MacLise Papers. 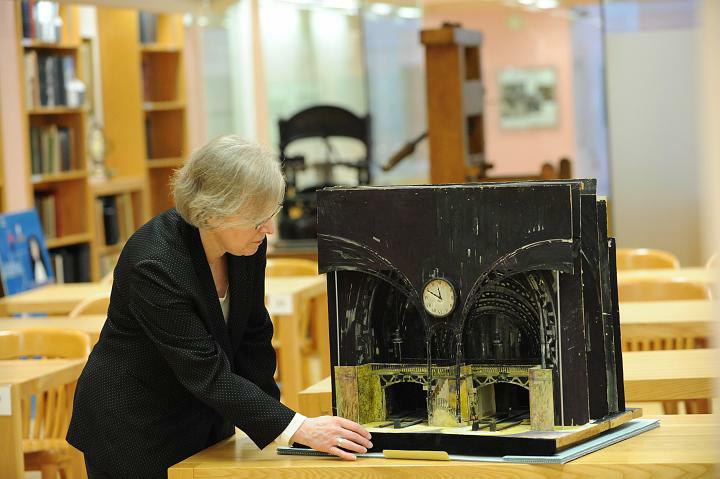 This entry was posted in Literature Collections and tagged Finds! on May 12, 2017 by Columbia Rare Book & Manuscript Library.